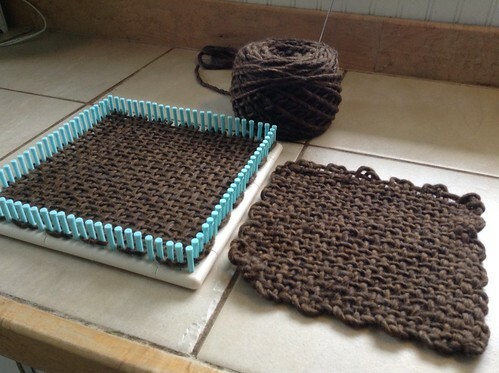 I bought a Martha Stewart Knitting and Weaving Loom, mainly because I wanted the flexibility to make different sizes. Plus, I liked that the smaller pegs created a small gauge loom with the pegs measuring 3/8″ apart. So far, I’ve used it in three ways: the big square (13″?) 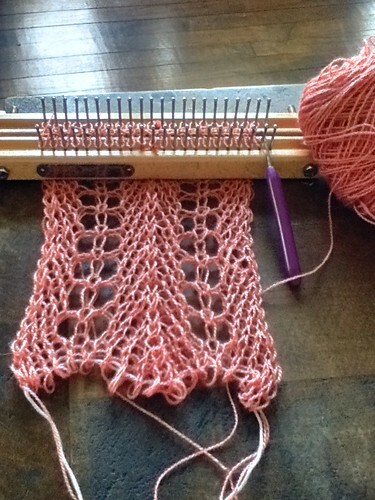 to weave some “Weave-It” style potholders out of super bulky yarn; the small square (7″) to weave a continuous weave potholder; and a circle, to begin knitting a garter stitch washcloth… dishcloth. We’ll see how it goes. Although it’s nice that it breaks into pieces, which is always a plus, the negative is that the pegs are removable, and they do pop out. I tried very hard to keep them secure, but the blue (smallest) pegs were very irritating with purling a stitch, which puts some tension on the peg as you lift the loop off. I imagine using this when I’d like the smaller gauge or playing around with the squares. If I had to do a larger project, I think I’d try the slightly larger pegs first to see if that would help. I just started knitting this Lacey pattern scarf from the Authentic Knitting Board website using some leftover silk/alpaca yarn. I’m hoping for something lightweight for summer. It's true. Scarves have taken to the trees, and here are the pictures to prove it! The first, a bright orange mohair/merino scarf which was knitted on the blue Knifty Knitter loom with the garter stitch, literally jumped off the wearer's neck and wound itself around this branch. The second, a lovely rayon multicolored woven scarf, made on the Glimakra Emilia with a 10 dent heddle, scrambled away from the person attempting to photograph it and took refuge in a nearby Elm. Although the mohair scarf was captured and is now safely tucked into an arm of a jacket, the colorful rayon scarf is still a bit wild and will most likely be mailed out to a niece, who had recently requested a "blue, purple, red, yellow, white, and green" scarf. (Okay, there's not much blue or white, but it's close!) It is hoped she will be able to train the scarf to stay around her neck, which is where it belongs. Last night, I knitted a small sample on the 28" Authentic Knitting Board using just 22 pegs (and 22 pegs on the opposite side, too). I used some Berroco merino and followed the beginning of the pattern for the Luxurious Alpaca Scarf. What I learned is that I need to tighten the gauge because the knitting was a little bit too loose and the ribbing, which starts after six rows of stockingette, was not very distinct. This board can be adjusted. Do you see the bolt on the end? There's another one on the other end, too. You may remove the bolt, take out the spacer in between each side, and then put something smaller in between, such as a washer. I'll have to scrounge around in the toolbox tonight for something appropriate. The closer the two sides of the board, the tighter the gauge. So, if you're working with a chunky or bulky yarn, or if you want a very loose knit, you would actually put more space in between the two sides instead of keeping it snug. I was brainstorming last night and came up with a way to, possibly, turn this two-sided loom into a round loom by adding my own type of spacer (a piece of wood with two metal pegs). That way, I could knit socks or other small-gauge items in the round. We'll see how it goes. I just spotted these simple and antique-y dishtowels on the Purl Bee's website, and I wonder if a similar towel could be knitted on a loom. Aren't they lovely? I've knitted a few dishcloths in the past, but I've never been pleased with the large-gauge finished product; however, if I use the garter stitch throughout, I bet they would come out fairly nice, especially with the stripes. I also think these would be perfect as a double-knit project with a rake or knitting board, especially something in the small to fine-gauge size. Something to think about! I've been hankering to make a scarf, and after much thought, I chose a lovely Berroco Merino Pure in bordeaux. I decided to try the whole thing in a garter stitch pattern on the blue Knifty Knitter. After much trial and error, I frogged it and started again, this time on needles. After another try, I frogged it again, wondered why I really needed another scarf, and put everything away. But today, I decided I really wanted another scarf, so I pulled out my little-used purple rectangle loom, an absoloutely enormous amount of Cascade Eco+ (7811) — one skein is about 475 yards — and an old sheet of wrapping patterns. Using just ten pegs (twenty if you count both the top and bottom) and a ribbed pattern, after just an hour or so, I had nearly two feet of my very, very purple scarf finished. I think at over $90, this may be a future Christmas gift and not just a little splurge. However, I must say that the DA Looms are lovely, well-made, and something a future loom knitter will be ecstatic to find in a treasure box 100 years from now, so the price is worth it, but with my budget, it does rank as a "super special" gift. 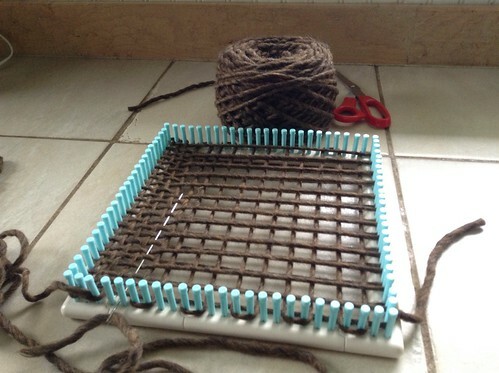 Besides, my one try at using a sock loom was pretty disastrous. I started out with my lovely EFG DA Oval Sock Loom, but didn't get past the toe. It seems that my eyes and very close, tiny knitting don't get along, and as a result the loom has been gathering dust for over a year. I've often considered swapping it with someone who owns a FG sock loom to see if a larger gauge would keep me interested. It's possible I'm simply not a sock knitter; but with an entire skein of bamboo sock yarn waiting for a purpose in life, I feel compelled to try again. I saw this Knit-Wit kit on sale but didn't buy it even though it was the last one, figuring I had enough flower looms; however, I decided if it was still there the next time I shopped, I'd get it… and it was, sitting slightly askew just the way I left it even though more than a week had passed. For $5.00, I can call it fate, a bargain, or maybe both. Knit-Witting is sort of soothing, once you get the hang of it. What next? A pantsuit, perhaps? Thankfully, the biggest project I've ever completed consisted of 1.5 skeins of yarn, so I don't think a flowered pantsuit will ever be loomed by me. 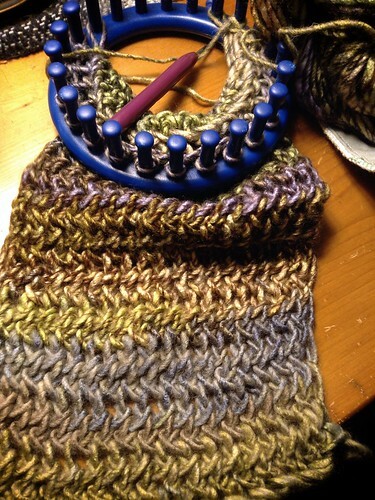 I knit mittens on my blue Knifty Knitter loom, using the one loom mitten pattern. I changed the cuff by doing two rows of the garter stitch, plus I knitted a few extra rows. Because I used 100% wool, I then felted them. They shrunk, a little. I'll post another picture soon. They'll need another good wash/dry to get to the perfect size. The good thing about these is that I'm not really fond of them–if I lose one (which has been my habit this winter–I've lost one mitten and two gloves), then I'll have an excuse to make another pair, maybe in a better color. I bought one of those huge fisherman's wool skeins two years ago, and I've been using it for projects since then. Now, it's nearly gone. Hooray! … I sense a new project heading my way. Here's my new book: "Learn to Knit Cables on Looms," by Isela Phelps. And here's my new yarn: "Marry" by Rozetti. There was something about the soft, fluffy texture that drew me in, so different that my usual 100% wool choices. So, what'll it be? 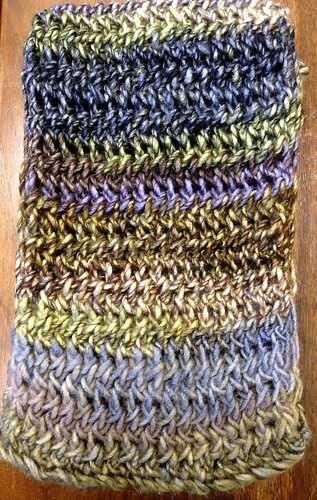 A cabled scarf, maybe? A cabled bag? Socks? Oh! Maybe a hat!